BRAND NEW VEHICLE REAR VIEW BACKUP SYSTEM - COLOR LICENSE MOUNT INFRARED CAMERA WITH 3.8" TFT LCD REAR VIEW MIRROR MOUNT MONITOR!!! The TFT LCD Rear View Mirror Monitor Has Both Front Panel Menu And Wireless Remote Control! Up to TWO Cameras Can Be Viewed On The 3.8" Digital Video Monitor Within The Mirror! Also Works With Our Many Other Addtional Rear View Cameras! 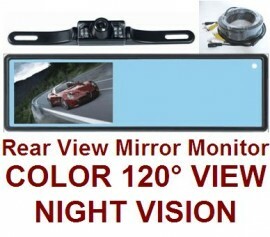 One COLOR Weather/Water-Proof Wide Angle License Mount Rear View Camera With Wide View Angle, Video, and Night Vision. Approx. 9.8" width x 1.2" height x 0.6" length (size includes license-mount attachment). ANOTHER FREE BONUS!!! - 32' or 49' cable to connect the backup camera and rear view mirror monitor, with heavy duty weatherproof connectors!!! License Plate Mount Camera-mounts to existing license plate screws requiring no new holes! 120 Degree wide angle precision micro lens! - Essential to get a wide picture view especially when backing up a towed vehicle or a vehicle with wide turning radius! 3.8" high resolution and super sharp digital screen within the rear view mirror!